Ysolda’s Icing Swirl slouch, knit up in a bulky thick n thin handspun art yarn that was gifted to me by Ms. Funky Carolina. Don’t know the name of the colorway, but I sure do love it! I also knit up a quick snood in some handspun (also a Funky Carolina blend of bamboo and merino fiber – the colorway is “Daze” and I spun it up earlier this year) that was quickly appropriated by Daughter #1. Daughter #2 is modeling it. There’s 3″ of a lace slouch in more Funky C handspun on the needles. Don’t know why I’m on such a knitting kick, probably something to do with the change of seasons and my desire for more variety in headwear. I have something on my head anytime I’m out of the house, and I do get tired of scarves. Some cute winter hats are exciting! 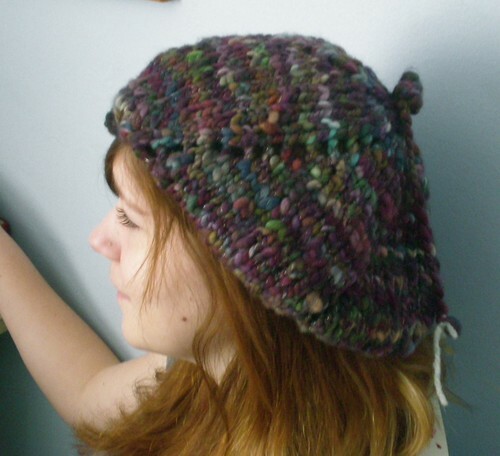 The hats are great – love the handspun! Just curious, though, why do you almost always wear something on your head? Oh! I always wear something on my head because I go to a Modern Orthodox shul and am aiming towards that level of observance. 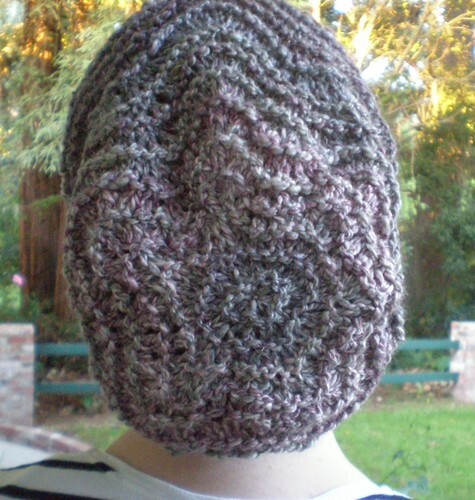 One of the first things I began doing when I began to be more observant was to cover my head. Orthodox, MO, and some Conservative Jewish women who are married, cover their hair – either with a hat, a scarf or a sheitl (wig). It is, for me, sort of an outward statement of being a part of that community and of my intent to become fully observant. Even though the ex Mr. H&O and I are separated, we are still legally married. When we officially divorce and I am ready to seriously date again, I will stop covering until I remarry. It’s a little like wearing hijab, just, a different community’s standards/style/reasoning. Love all the hats and daughter #1’s sugar flowers. All so beautiful. Good luck getting you all healthy and shots. Gorgeous hats – I adore that handspun in the icing swirl too. I just read your reply to the comment about wearing a head covering every day. I found it very interesting and laughed at the practicality of never having a bad hair day! it is a total bonus. The other bonus to dressing Modern Orthodox? NO PANTS. I have a few old pairs left which I wear around the house or under my older short dresses (tunic style) if I’m going out, but when they’re gone, they’re gone. So, no more struggling and shopping for hours trying in vain to find jeans that fit right. EVEN BIGGER BONUS.